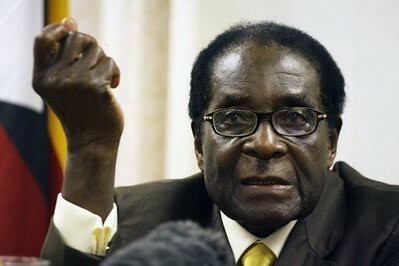 Zimbabwe President Robert Mugabe, chair of the African Union Peace and Security Council, has announced that the AU will back the Libyan government under Gaddafi and a coalition government in Ivory Coast. The PSC met in Ethiopia on March 10-11, 2011. a photo by Pan-African News Wire File Photos on Flickr. Tafataona Mahoso: Relevance of anti-sanctions campaign . The recently concluded Euromoney Conference looked farcical on the surface and was interpreted by some of our local media as not only farcical but also insulting to patriotic Zimbabweans who had just launched the most massive demonstration of popular mass opinion ever mounted in the history of Zimbabwe in the form of the national anti-sanctions campaign on March 2 2011. --The Euromoney Conference masqueraded as a serious investment gathering but it turned out to be a political platform where the forces funded by the same sponsors of Euromoney (including the MDC formations) tried to justify their existence, to tarnish the image of Zimbabwe further and to justify the extension of European and US sanctions against the very same country which the conference claimed to be promoting as an investment destination. --If the organisers and sponsors wanted to convince the nation of their good intentions they would have postponed the conference to three or six months after the anti-sanctions campaign launch so that, in communication terms, the Euromoney and Zimbabwe Investment Conference would not directly contradict and assault the massive national anti-sanctions campaign of the previous eight days. --In terms of communication, the fact that US President Barack Obama in his message against Zimbabwe echoed the same lies being peddled by the MDC formations at the very same Euromoney Conference; and the fact that the sanctions were renewed during that very same conference, actually damns the organisers and those apologising for them. This is so in terms of public communication. --And the conference was a political communication exercise, not the start of a genuine investment campaign. A serious investment campaign would have joined the anti-sanctions campaign first and demonstrated its respect for the millions of Zimbabweans behind that massive anti-sanctions gathering. In Africa and the rest of the South, so-called non-governmental organisations, including “business” organisations, are sponsored and used by imperialism to raise and float political balloons on behalf of their governments. Balloons are associated with child’s play but they are serious business. Workshops, seminars, conferences and even protest rallies organised so frequently by these NGOs are trial balloons, even when they flop. The more of them there are, the more up-to-date and regular information the empire obtains. --How many people looked up when the balloon was raised and floated? --How many people bothered to read the messages painted on the balloons? --How many of those who read the messages understood them? --Who exactly read the message or messages? --Who understood the messages and the intention behind them? --Who agreed to say something in response to the balloon and the messages? --Which ones bought and which ones rejected the balloon and the messages? In terms of African history, the imperialist struggle against African autonomy and sovereignty has targeted African platforms with the intention to supplant and replace them. The white missionary was the first communication platform builder for the empire. When King Lobengula by-passed his induna and instead asked Reverend Charles Daniel Helm whether or not he should impress his thumb on the treacherous Rudd Concession, he had shifted from relying on the bandla or dare to relying on the white man’s negotiating forum or roadmap. He now trusted the so-called “man of God” in the person of the white missionary, Charles Daniel Helm of the London Mission Society in the place of the King’s own dare of advisors. In other words, the African king did not only look up at the balloon floated by Cecil John Rhodes who represented the white imperial Queen Victoria; by looking up, the king removed himself, his eyes and his mind from the dare ravanhu. And it does not take a genius to notice that Lobengula’s substitution of the word of Reverend Charles Daniel Helm for the advice of his own indunas precipitated fatal divisions within the Ndebele hierarchy, within the whole society; and it led to tragedy for what is now Zimbabwe. Although wearing the non-governmental cloth of God on behalf of the non-governmental London Missionary Society — in fact Charles Daniel Helm represented empire builder Cecil John Rhodes, who in turn represented the expansionist interests of the imperial Queen Victoria. Like today’s foreign-sponsored churches and NGOs, Reverend Helm was the beneficiary of bribe money (Euromoney) from Cecil John Rhodes which came to the reverend in the currency of “gold sovereigns”. In other words, although the Euromoney-Zimbabwe Investment Conference digitally dazzled the eyes of ambitious elites seeking business opportunities, it was based on a centuries old Euro-template. This template has been activated to its most hyperactive levels because of the threat of a resurgent Pan-African template assisted by a new Chinese template. It is not just the whole economy which is targeted. The African mindset has been targeted from the day the first missionary arrived here. This centuries-old template is responsible for the aura with which some Africans are willing to endow such words as the clergy, civic society activist, expatriate, aid officer and donor. These words are meant usually to imply a white person or an African groomed, screened and appointed by white society and white people to service the misery (chema) economy in the interest of imperialism. On the other hand, Africans who find themselves in Europe and North America, even when they qualify to be missionaries, expatriates and experts, will not enjoy the same labels or the aura with which they have been endowed in the South. These Africans are often referred to as border jumpers, economic refugees, illegal aliens and boat people (if they happen to arrive by boat). The African must radically review and revise laws governing NGOs. For instance, on January 13 2011, Zimbabweans woke up to a front-page travesty entitled “Sanctions must stay — NGOs”. In terms of proper journalism, the story was not worth publishing, let alone occupying top front position as a major scoop. It purported to have discovered a widespread and deeply held opinion in support of the illegal and racists Anglo-Saxon sanctions against Zimbabwe. But upon reading the story, one realised it could have been titled “Brussels-based racist purports to speak for Zimbabweans”. The supposed name of the NGO was ZEN (Zimbabwe-Europe Network) and its Brussels-based “co-ordinator” with the Nordic name of Tor-Hugne Olsen claimed to represent 20 organisations in nine different countries, which could mean just 20 individuals in nine of the 27 EU countries. In the name of democracy, the alleged 20 individuals sitting in unnamed countries spoke for 14 million Zimbabweans who are daily injured by illegal and white racist sanctions. The reader can say that Africans should expect white racists to go even to the extent of making up certain claims in defence of white racist interests. Why should that be surprising? But that is not my reason for including this example in this instalment. My point is simple: the paper which made the fabrication a top page story claims to be an African paper edited by an African editor. The editor did not bother to identify the names of the alleged 20 organisations in the so-called “consortium of more than 20 non-governmental organisations”. He did not bother to demand the name of the leader of each one of the alleged 20 organisations. He did not bother to establish the interests of each of the alleged 20 organisations and how they came to represent the people of Zimbabwe on the sanctions issue and on democracy and human rights. Above all, he did not establish why some Brussels-based individual with the name of Tor-Hugne Olsen, representing something called ZEN, should speak for Goredema, Mhuriro or Mandiwanzira in Zimbabwe. Even worse, there was no outcry against this published travesty of a sanctions story placed on the cover page of a supposedly Zimbabwean paper. It is also no coincidence that the Pastoral letter of the Zimbabwe Catholic Bishops Conference issued January 2011 focused on ownership of Zimbabwe’s liberation history. The bishops’ conference is part of a long lineage of political balloon raisers, intercessors, interveners and mediators between African leaders and African communities, between African nations and white imperialism. The Catholic Bishops Conference is the heir to Reverend Charles Daniel Helm of the Rudd Concession. It is the forerunner of Euromoney. This long lineage to which the Catholic Church belongs is responsible for the stubbornness of the white template through which even the mass media owned by Africans themselves continue to misrepresent African leadership. This lineage started with the white missionary as the smiling face and intelligence officer for imperialism and colonialism. That is exactly the role Reverend Helm played in the Rudd Concession. But the empire always adds new players. In the 18th century the white missionary alone was no longer adequate to play the function of smiling face and intelligence officer of imperialism and colonialism. Another layer and persona had to be added to the system because the white template needed to look more scientific and more rigorous than the missionary could muster. The missionary was a good communicator for the empire but he was not scientific and he did not sound scientific in his missionary anthropology. So the crude anthropological work performed by the missionary was taken over by academic anthropologists in order to give white racism and the racist template a pseudo-scientific aura. But while the academic anthropologist was a good researcher and good organiser and interpreter of data on Africans, he was a poor communicator in the propaganda sense. He could not adequately popularise the pseudo-scientific conclusions reached. He was a bit slow, abstract and hesitant. His balloons were not colourful enough. So, in the 19th century, especially as imperialism became a scramble after the Berlin Conference of 1884, the white journalist was found to be a better user and populariser of the great prejudices and distortions of Africa documented by the missionary and the anthropologist. A classic example of that change was Henry Morton Stanley, who came looking for David Livingstone on behalf of the New York-based Herald Tribune. But after the two European wars against Germany, after the emergence of the former Soviet Union and China as socialist societies subscribing to an entirely different template — the missionary, the anthropologist and the journalist were yet again found to be inadequate by themselves. The missionary was found to be restricted by too much religion and the journalist was too much of a reporter and not adequately imbedded in African society in order to defeat the appeal of the Soviet Union and China. What the Soviet Union and China presented was not only a non-religious challenge to the missionary and a different approach to the media but also a shortening of the path to what the West called “civilisation” which was quickly renamed “development”. Indeed, Euromoney claims to offer “investment and development” with illegal and racist sanctions. China and the former Soviet Union insisted that Africans could achieve for themselves in two generations what the West claimed to be doing but failed to do for them in 400 years of empire, colonialism and apartheid. So the West quickly re-invented “development” as a strictly anti-socialist, anti-communist ideology with “foreign aid” projects managed by NGOs as its props. The West was forced to tone down the religious tenor of the missionary. And the Western journalist required the help of a new secular missionary in the form of the programme officer and project officer of development aid who now implements the secular chema economy of today while the journalist gives it publicity and legitimacy. The NGO programme officer and project officer enjoy the advantage of being secular and being “professional”, which means that he or she can do excellent spy work for imperialism under the cover of development aid. Because of the disastrous effects of neo-liberal economic structural adjustment, and (in Zimbabwe), because of the effects of illegal sanctions as well, the number of foreign-funded NGOs has increased more than 10 times since late 1980s. There are now about 3 000 NGOs in the country. But the National Association of Non-Governmental Organisations (Nango), which groups these 3 000 bodies together, did not speak at the anti-sanctions campaign launch. It has not condemned the white racist sanctions imposed on the people. Running parallel to the “civil society” network or superstructure is the series of military and intelligence co-operation programmes which Africom is supposed to consolidate. Once Africom is in place, the recolonisation process will have been completed. Farai Maguwu, Jenny Williams, Jestina Mukoko and Beatrice Mtetwa would then have their military counterparts right in our midst. And there would be no end to co-ordinated manipulations such as what was recently attempted against Zimbabwe in Tel Aviv during the fourth week of June 2010 at the Kimberley Process Certification meeting and what was attempted on March 9 2011 at the Harare International Conference Centre and through the Euroballoon Conference. There, we learn that the British Ambassador Andrew Canning argued that the Zimbabwe Minerals Marketing Corporation was under illegal sanctions because its operations were not transparent! What this means is that only white racist countries such as those in Europe and North America can define what transparent operations are in Zimbabwe and only they have the right on account of white racist supremacy to impose the illegal and racist sanctions. That is why China, Russia, India, Brazil, the whole of Africa and the Non-Aligned Movement have not imposed sanctions on Zimbabwe. In fact, most of these have come out in opposition to the sanctions. So one can see that this is a racial thing. It is white supremacist nations who believe Zimbabwe is not ruled properly and must therefore suffer illegal sanctions. But Zimbabweans have mobilised, en masse, to fight back. Libya: A Replay of Iraq? White Man's Burden, Again in Libya?